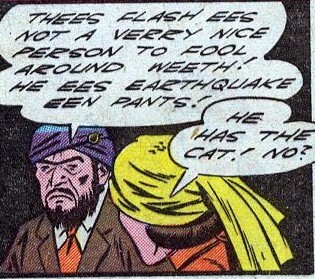 Not only that, but when I hear that “earthquake in pants” line in my head, it comes out in a French accent like Pepe le Pew’s; but the guy saying it is wearing a turban! Go figure! Off topic: A few days ago, I came up with an idea for a space pirate/mercenary character called The Marauder. Think of him as one part Blade, one part Shaft, and one part The Rock. First I drew him in Fabrica de Herois (Hero-O-Matic) and he came out looking like a cartoon character. I redrew him in HeroMachine and he looks like a bad motha (Shut yo’ mouth! :)) wich was the effect I was going for. HeroMachine is still the coolest hero generator around. You rock, Jeff! Earthquake in pants… the best part is the second guy’s response! Is that an earthquake in your pants or have you stolen my cat? I beleive that that is a woman, not a guy H. Jack.